The Millennium Declaration, signed by over 180 world leaders at the start of the new millennium, committed the international community to targeted achievements on a number of goals by 2015. Along with poverty reduction and human development, these goals included gender equality and women’s empowerment. Now, as we draw closer to 2015, there have been worldwide consultations on what will replace the MDG agenda. 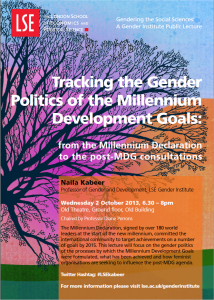 This lecture will focus on the gender politics of this process: the gender text, and sub-text, of the goals themselves, the extent to which gender advocates and activists were involved in the formulation of the goals, how the goals relate to previous gender-related commitments of the international community, including the Beijing Platform for Action and the Vienna Declaration on human rights and what has been achieved so far. It will conclude by examining how feminist organisations are seeking to influence the post-MDG agenda. Next story Esther Duflo on “women’s empowerment and economic development”: a must-read for feminist economists? Previous story Gender equality must be a development priority in its own right………………..